A regional daily’s three-year campaign for a specialist heart unit to be built has seen work finally begin on a new centre. 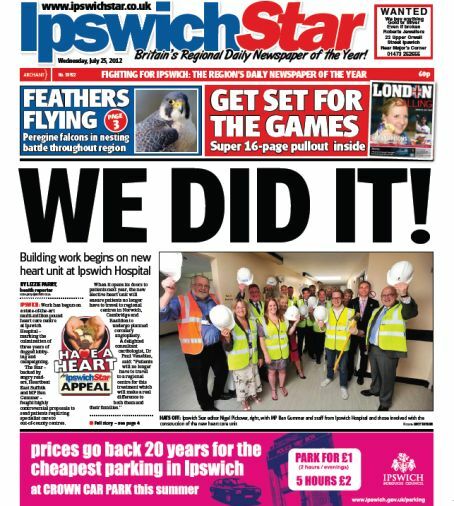 The Ispwich Star launched its Have a Heart appeal in 2009 after uncovering controversial plans to establish three regional cardiac centres – meaning patients needing emergency heart care or routine procedures would have to travel out of Suffolk. The paper’s campaign saw readers raise £30,000 and a review of the proposals was agreed by heart tsar Professor Roger Boyle, who recommended that Ipswich Hospital should have a non-emergency heart centre but not the emergency unit. In February, the Star revealed the Department of Health had granted the hospital £5m to pay for the building of the new centre after NHS Midlands and East put in a bid for the funding and work has started at last. Editor Nigel Pickover said: “When we started our campaign, we were aghast that Suffolk was being left with out emergency heart attack cover – and the future for cardiology services in general looked bleak. “Our view was that Ipswich was being left exposed – and that people’s lives may be lost because of decisions taken by NHS bureaucrats many miles away. So we fought and fought again and now have work starting on the new elective heart surgery unit. “It just goes to shoes what a campaigning newspaper can do for its community. And our fight will continue”. The new centre at the Heath Road trust, which is set to open next year, will allow patients to be able to have planned coronary angioplasty in Ipswich – an operation which involves narrowed arteries being widened in those who are at risk of suffering a heart attack. Ipswich MP Ben Gummer, who has backed the campaign from its launch, said: “Today is a day of pride for me and for Ipswich. The Star’s campaign has been going for three years and so to see work starting is really exciting. The paper is still continuing its fight to have emergency heart facilities in the county.